Pensacola State College has received a $342,720 per year grant from the U.S. Department of Education to renew its Educational Talent Search (ETS) program. The five-year grant totals more than $1.7 million. ETS identifies and assists middle school and high school students, encouraging them to graduate from high school and then successfully enroll and complete college or vocational training. Over the next five years, at least 714 students (including 214 from middle school) will be served. Two-thirds of program participants will come from families that meet U.S. low income guidelines and whose parents have not earned a four-year degree. The Talent Search program has been located at PSC for the past 30 years, reaching schools in Escambia and Santa Rosa counties, according to Linda Sheppard, ETS program director. “This grant renewal includes a much needed increase of about $34,000 per year,” Sheppard points out. “Now we can reach more students in more schools and provide more services to help them be successful at the college of their choice. While Talent Search provides academic tutoring along with career planning, academic and financial counseling to its participants, the real strength lies in the personal interest that students receive from the program specialists. “We take the students on bus tours to visit colleges in neighboring states as well as Florida colleges and universities at no cost to the students. All ETS services are free to program participants and their families,” Sheppard explains. Ty’Drick King, a 2016 graduate of Pensacola High School, says ETS helped tremendously on his journey to attending Florida State University this fall. 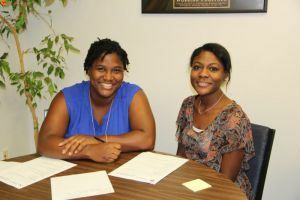 “During my senior year, Talent Search gave me helpful information on the college application process, scholarships and decisions regarding my future in college,” King says. Destinee Brundidge also graduated from Pensacola High in June and says she is attending FAMU because ETS specialists encouraged her to follow her dreams. “The Talent Search program helped me find the necessary tools to get where I needed to be and my specialist was always supportive of my decisions,” Brundidge says. With 25 years of experience at PSC and nine of those as ETS program director, Sheppard sees first-hand the improved college readiness of ETS participants. “It works!” she says enthusiastically. “In our previous five-year cycle, 75 to 80 percent of ETS program grads went on to enroll in post-secondary education at vocational, two-year, or four-year institutions. While numbers and success rates are impressive on yearly reports, Sheppard emphasizes that the caring relationships that are established between students and the ETS specialists – Lynne Butcher, Marcy Matthews-Bethea and Christi McCarley – are important beyond measure. Tytieyanna Young, a 2016 Pine Forest High graduate who is beginning her freshman year at PSC agrees that ETS specialists are pivotal to the program.